The Labyrinth: The body as technological measuring instrument Historically, the connection between the earth and our bodies and souls was of natural everyday use. It was carried out in religion and reinforced by law. Before building a house in Sweden, you were to hire a “slagruteman” to detect the right place in relation to the “Curry lines.” With the help of dowsing rods, the owner’s body was used as an instrument to detect the universal grid system. In Sweden, we have about 300 labyrinths, the highest incidence of labyrinths in the whole world. Yes, they do exist in many other countries as well and are built according to the same geometrical patterns and placed in relation to the energy lines. Our labyrinths are said to be an expression of an ancient fertility cult, a tradition that has survived in Sweden to the present day; a young woman stands in the center, and a young man tries to free her. I placed my labyrinth out in the snow, and the earth energy lines were detected traditionally, with dowsing rods. 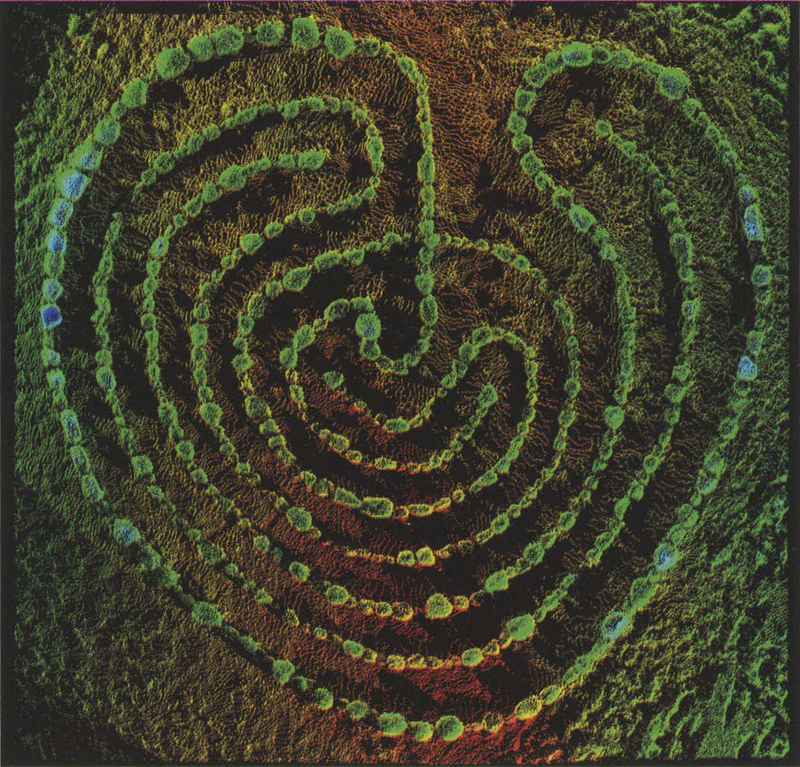 The stone labyrinth was then digitized with a 30 laser scanner and exported to Maya and Photoshop in my computer, where I edited and printed it out, to share it with you. Walking the labyrinth, you can find answers to all your questions, even the meaning of life. This work uses the latest technology to get in touch with the oldest knowledge and bring us to inner peace, truth, and love. The Labyrinth is the result of a two-year collaboration among the artist, the GIS-institutet and the Creative Media Lab at the University of Gavle. The labyrinth was physically placed out in the snow, laser scanned with a 30 laser scanner from three directions (Leica HOS2500), imported into Maya, and printed.